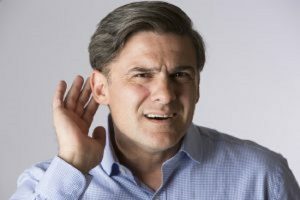 What Type Of Hearing Loss Are You Suffering From? It’s important to know what type of hearing loss you are suffering from because there are different treatments for each. Not all hearing loss is created equal. In fact, the type of hearing loss you have dramatically impacts the way you’ll want to treat it. There are four main types of hearing loss: Conductive, Sensorineural, Auditory Processing Disorders, and Mixed. To find the best way to improve your hearing, first you’ll need to identify which type you suffer from. If you noticed hearing loss after suffering from an ear infection, a punctured eardrum, fluid buildup, abnormal bone growth, or excessive earwax, you may have Conductive hearing loss. This is the result of a problem in the middle or outer ear, it can be either temporary or permanent depending on the level of damage. Middle Ear Implants, Bone Conduction Hearing Aids, Bone Anchored Hearing Devices, and surgery are all potential ways to eliminate or improve the symptoms. If the Cochlea, the hearing organ, or the auditory nerve suffer damage it may result in a loss of hearing. Disease, excessively loud noise, exposure to certain types of medication and chemicals, genetics, and old age can all be factors that contribute to Sensorineural hearing loss. Unfortunately, this type is almost always permanent. However, hearing aids, cochlear implants, and hybrid cochlear implants have all been successfully used to help those suffering from Sensorineural hearing loss. If auditory sound can be perceived but the brain is unable to process the information contained, or the location it came from, an Auditory Processing Disorder (ADP) may be the culprit. Individuals who suffer from ADP are able to hear but have difficulty understanding the information sounds contain. As the name suggests, mixed hearing loss is the term for when both Sensorineural and Conductive hearing loss are present at the same time. While the Sensorineural damage is permanent, the conductive aspect may be temporary. Want to learn more about the different types of hearing loss? Our Doctor of Audiology, Dr. Trisha A. Bents Muth, is exceptionally experienced in the art of audiology and is dedicated to providing the absolute best solutions. Bay Area Audiology has been working to give patients a comfortable environment, with thorough evaluations. We are independently owned, and unbiased when it comes to finding you the care you need. You can always come into the office, or contact us in advance to set up an appointment. We also provide updates on our social media websites. You can check out our Facebook, Twitter, Google+, LinkedIn, and Pinterest to keep up with Bay Area Audiology. This entry was posted on Friday, April 6th, 2018 at 3:19 pm. Both comments and pings are currently closed.